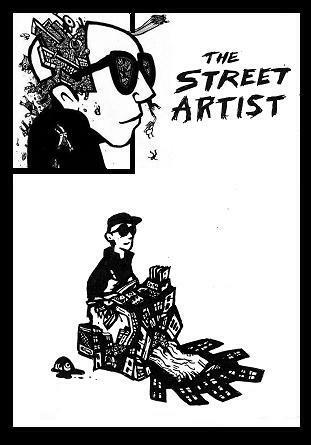 STREET ART COMICS! When I started documenting the city through my comic book art I rendered the metropolis as an ominous gear propelled by an endless sea of faceless denizens. In order to investigate the situation further I set out to the heart of the downtown core and started doing street art exhibitions and live painting demonstrations. The idea was to immerse myself in the city’s routines in order to conduct an unconventional interview as many people, buildings and urban experiences as possible. During that time I met many a weird denizen; peoples from all over the globe and of all walks of life. I would set up a make-shift studio gallery right on the sidewalk in some of the busiest parts of Toronto. 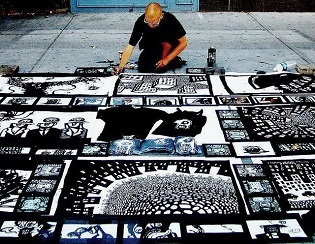 Everyday for almost 5 years I sat out there painting giant cartoon murals and engaging in unique conversations with total strangers. The experience was unlike anything I have ever encountered as I discovered a way to connect with people while initiating intelligent and subversive discussions about society, politics, sustainability, philosophy and many other amazing topics. I was particularly inspired by the broad range of people that I encountered which included everything from homeless derelicts to Hollywood movie stars. As a result of this public experimentation both the artworks and myself have evolved immensely. Today I still draw the city as a giant gear, only now it is all the unique and crazy people, not faceless cogs who fuel the machine. The “HEY APATHY!” comic book series attempts to explain some of the unexplainable absurdities of urban existence I bore witness working the streets. Like my own existence the stories mix true life characters with imaginary ones as I struggle through an internal debate between the world of comics and facing reality. ALSO CHECK OUT THE GRAFFITI STREET ART PAGES!